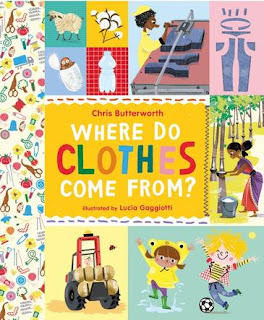 Kids' Book Review: Review: Where Do Clothes Come From? Review: Where Do Clothes Come From? Another addition to the series by Chris Butterworth and Lucia Gaggiotti, this book takes readers on the fascinating (and often un-thought of) journey of how our clothes are made. Focusing on a particular item of clothing, the author takes the reader through the process from start to finish. For example, with Jean made from cotton, we see how the plants are grown, harvested and processed, how the fibres are rolled, pulled, stretched, wound, and dyed, how the yarn is woven to make cloth and then how the cloth is then cut and sewn into the jeans we wear. When read with an adult, the language used throughout the book is appropriate for children from approximately 3-4 years old. The use of correct terminology of the materials, machines and processes used to make each item of clothing creates a great opportunity to introduce many new words to younger readers, within a context they can understand. Independent readers may require some assistance with pronouncing, learning and understanding these new words. I highly recommend both titles in the series, Where Do Clothes Come From? and Lunchbox: The Story of your Food, my four year old was completely fascinated and to tell you the truth, I was too! Title: Where Did My Clothes Come From?